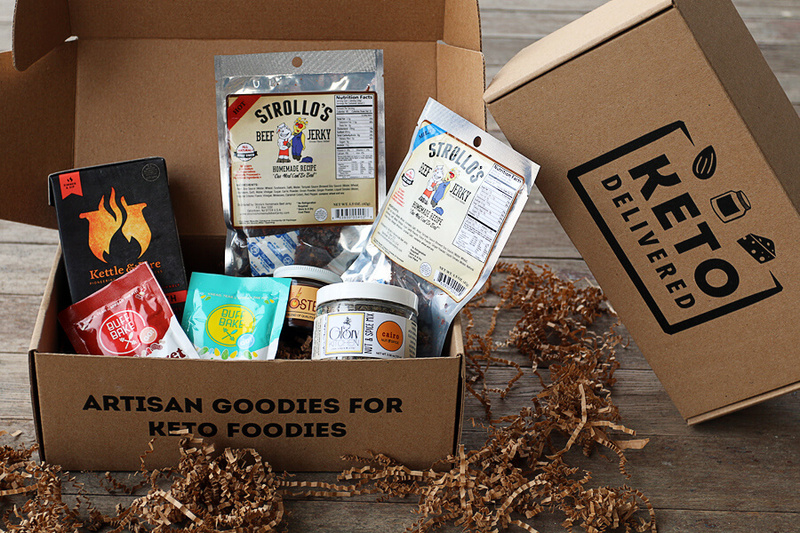 In this month’s Keto Delivered box, I wanted to bring some new items that I dug up while searching for small companies across the US. Some were given to my by awesome customers (you get a 20% off coupon code when you do and the item is used! ), and some were found scavanging forums and farmer’s markets asking for different ideas from different people. As always we’re bringing you a couple of snacks for your emergency snack “fund” and a few new items to cook with (of course)! I was really excited to have a blend of spice that really took spices to a new level. It includes a textural contrast of chopped nuts and it can really add an awesome, crunchy texture to any dish you might have found bland in the past. We have bone broth and ways to elevate your coffee in the morning to make sure your electrolytes are on par (no headache, fatigue, mind haze) and your energy levels are always high, too! So, what’s inside the box you ask? Let’s get into it! 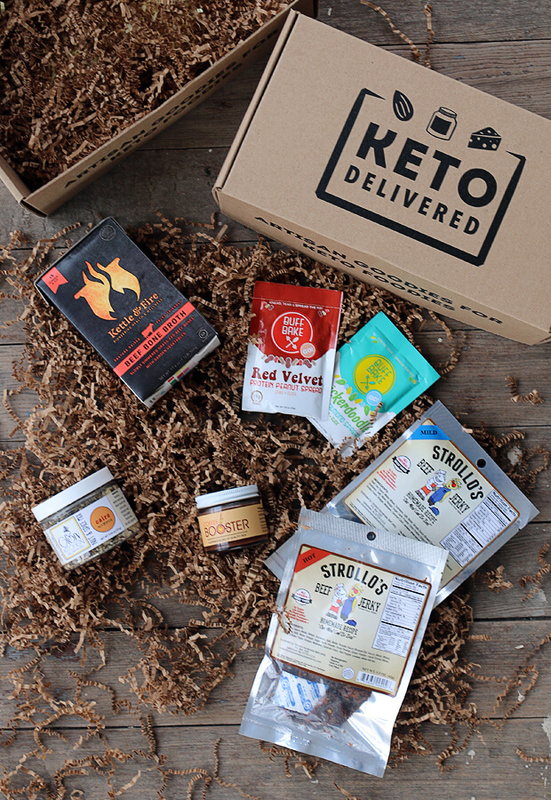 Here’s the February Keto Delivered, unboxed for you! Their products are made using clean, real food ingredients created by nature. 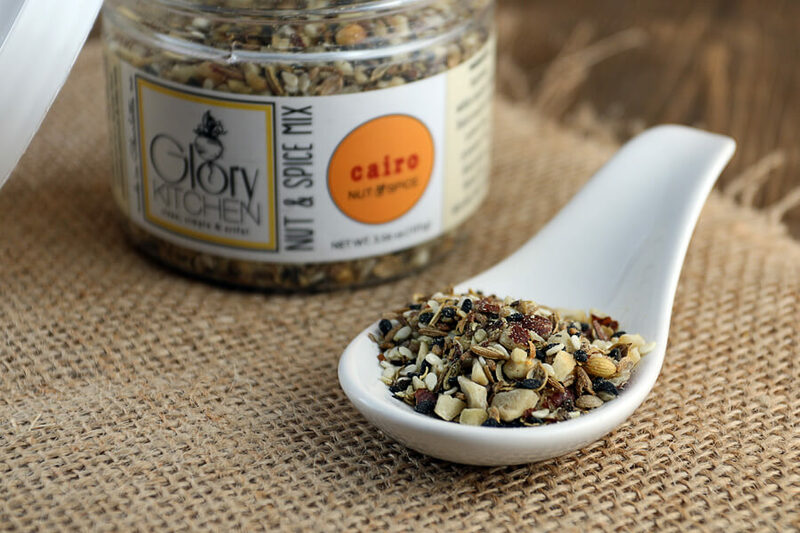 Each jar of nut & spice mix is made up of about 50% chopped nuts and then it is paired with seeds, dried peppers, herbs and spices – all natural, plant-based ingredients. The ingredient list in each of the blends is front and center on the label of every hand chopped and hand packed jar. No preservatives, no added chemicals – just pure real food. They have a blend for every mood: Asian, Mexican, Middle Eastern, Indian, French and Italian, each one made with a different nut. If you ever wanted to spice up your food while adding texture to a sloppy type of meal, this is definitely for you. With the texture of the chopped nuts coming through, it’s definitely something that I wish I had thought about a long time ago! From simple deviled eggs (great crunch) to making your fried chops even crunchier with a great Chicken Fried Pork recipe. This spice blend goes above and beyond at delivering the flavors too. Cairo has a great hint of cumin which really goes great on just about any type of meat – and I’ve been using in copious amounts since I got it. Make sure to use coupon code KETOFRIEND for 20% off! 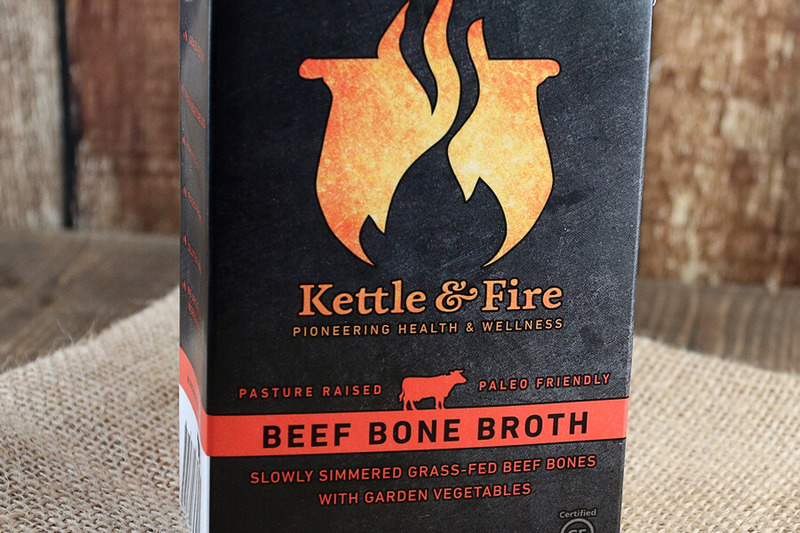 Kettle & Fire is America’s first shelf stable, grass-fed beef bone broth on the market. They keep things real by keeping them simple. Their bone broth is made with 100% grass-fed and grass-finished bones, organic vegetables, organic herbs and apple cider vinegar. It’s then slowly simmered for 24+ hours to give their bone broth plenty of time to absorb the many nutrients and minerals their premium ingredients have to offer. Most people know bone broth is fantastic for you. The bone is something that definitely shouldn’t be judged by it’s cover. It has many anti-inflammatory and gut-healing proteins and a ton of micronutrients packed into each and every bite. It’s one of the reasons that drinking bone broth is recommended to anyone that starts keto. We all know about the keto flu – and bone broth combats it with precision. You can make some fantastic soups with this. Just one example is a more out of the ordinary Breakfast Soup that I whipped together feeling slightly dehydrated and wanted to replenish my electrolytes to instantly make myself feel better. Definitely give this one a try! Make sure to use coupon code ketobonebroth for 20% off! 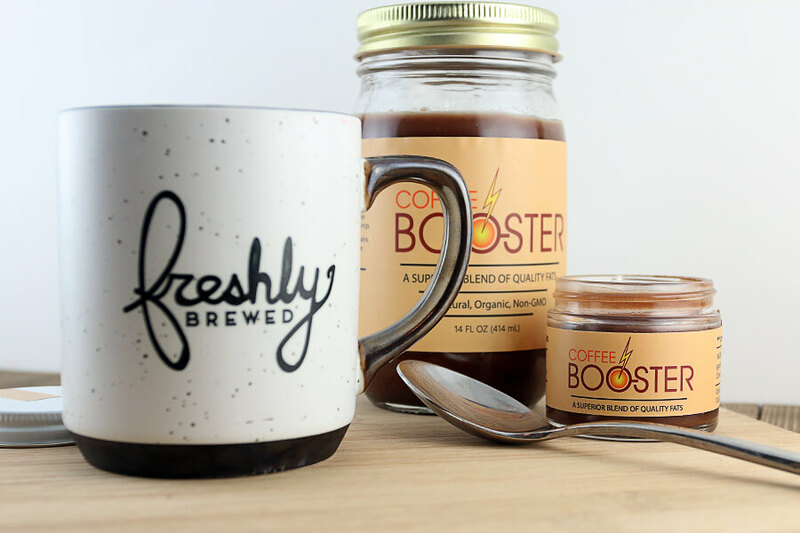 Coffee Booster is a blend of delicious fats designed to be added to your morning coffee. They are obsessed with finding tasty ways for people to incorporate more healthy fats into their diets, which inhibit hunger cravings, improve focus, and help live a better life. Coffee Booster is made in Minneapolis, Minnesota. You can follow them on Instagram for more details! Coconut oil is just an awesome ingredient to add to your coffee. It has fat burning properties (made of about 70% MCTs), can help with high blood pressure, stress, and is very high in antioxidants. Among that, we have ghee, while can help decrease the risk of cardiovascular disease and cacao powder which has been shown to improve fat burning as well. Add that on top of the time and time again proof at caffeine as a weight loss promoter, and you have essential weight loss in a cup! Since not everyone likes coffee, I decided that I wanted to bring something a little bit different to the table. I wanted to bring a mocha and a tea together – green tea to be exact. Tea has very much of the same benefits as coffee has, so if you’re not a coffee drinker then there’s definitely no reason not to try this! Take a look at the Green Tea Mocha recipe at Keto Delivered. Make sure to use coupon code KD1APR16 for 10% off on Amazon before May 1! 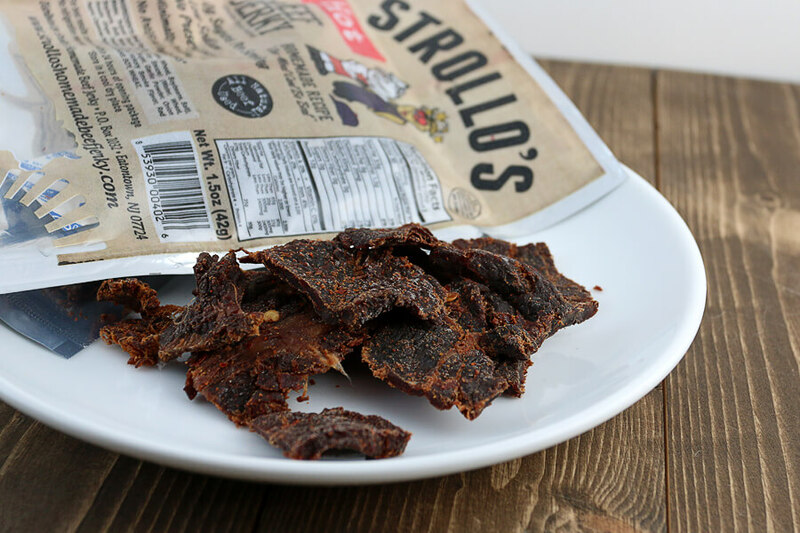 Strollo’s Beef Jerky stands for quality and taste and is the first artisan jerky to reach the mainstream market proving quality doesn’t have to suffer from high demand. Strollo’s takes great pride in their ‘Homemade Recipe’. They specialize in a low sodium jerky with a zero sugar content per serving giving their customers more beef in every bite instead of adding sugar and salt to their product. They also encourage you to compare their label and ingredients to their competitors and also TASTE the difference. This has to be some of the better jerky I’ve tried over the last few years. It’s the perfect combination of moisture mixed with chewiness. It’s not the dry kind of jerky that makes your jaw sore after only 2 pieces; it’s the type of jerky that really packs a lot of juiciness and flavor as you chew your way through it. Not only that, but Michael (the owner) is a fantastic guy. He dedicated the ENTIRE smokehouse to get this order out on time and to ensure that everyone was getting some of the freshest product in the boxes. It was a pleasure working with him, tasting and eating his jerky, and giving them as much business as I could. Make sure to use coupon code JERKY15 for 15% off! 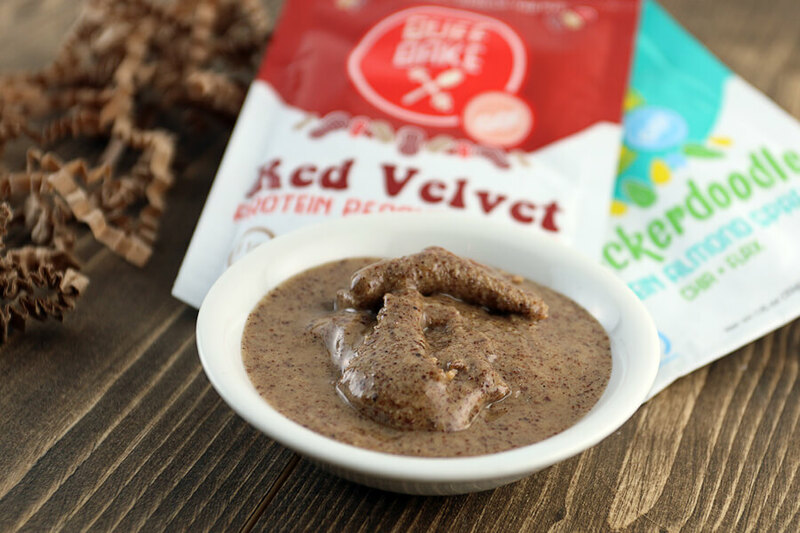 Buff Bake’s mission is to create real, protein-packed goodies that inspire individuals to live a healthy lifestyle and give them the ability to enjoy each and every bite! With all natural ingredients that you can actually pronounce, Buff Bake creates unique almond spreads, peanut spreads, and cookies that are enhanced with premium whey protein and superfoods such as Chia and Flax seed. This peanut butter is straight up delicious. Literally. These packs were made to take out on-the-go, knead, and eat as you want. The flavor is very intense, which I always love, and the texture is just right. If that isn’t enough for you, you can get really creative with it and turn it into a meal in itself. Check out this Red Velvet Cookie recipe which uses the Red Velvet Peanut Butter in both the icing and the cookie itself. It’s definitely got a great taste and the red coloring really shines through – which is something that’s rare on keto! Make sure to use coupon code KetoBB for 10% off! I hope you all enjoyed the delicious treats that were inside the March Keto Delivered box. I’ve been having a ton of fun sourcing new items, meeting new people, and of course – supporting small businesses. That’s something we can all get behind!